The best beaches to stay with kids in Bali happen to include most of the island’s popular beach resort towns. In other words, you can consider taking your family on a great holiday to almost any of Bali’s finest beaches – of which, Bali has many! Which one you choose depends largely on what type of family holiday you are looking. Do you want peaceful days spent in secluded bays or somewhere with plenty of family attractions and kid-friendly restaurants? Maybe a combination of both? We have given each of the most popular areas for family vacations in Bali a rundown, listing what’s good and what’s not so good, to help you be better informed where you’re going and what you and the kids can do there. Should I Stay in Nusa Dua with my Family? 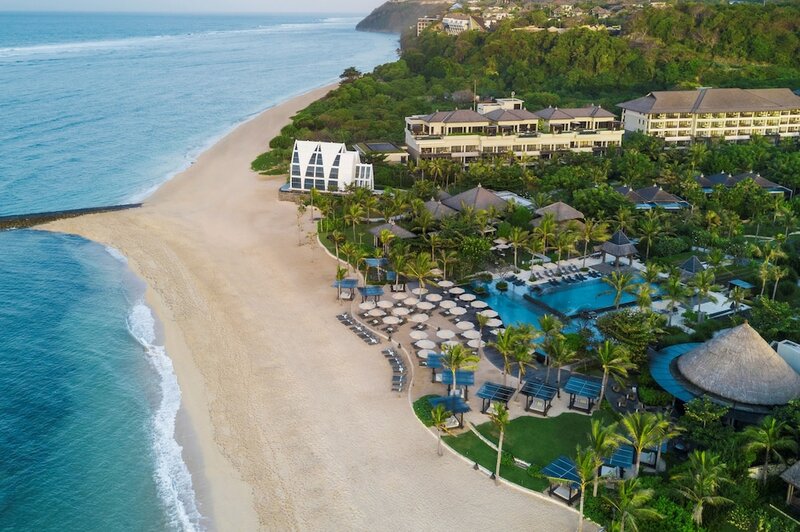 Nusa Dua is perhaps the most secure and secluded beach resort complex in Bali, with its public spaces and infrastructure managed by the state-owned Bali Tourism Development Corporation (BTDC). 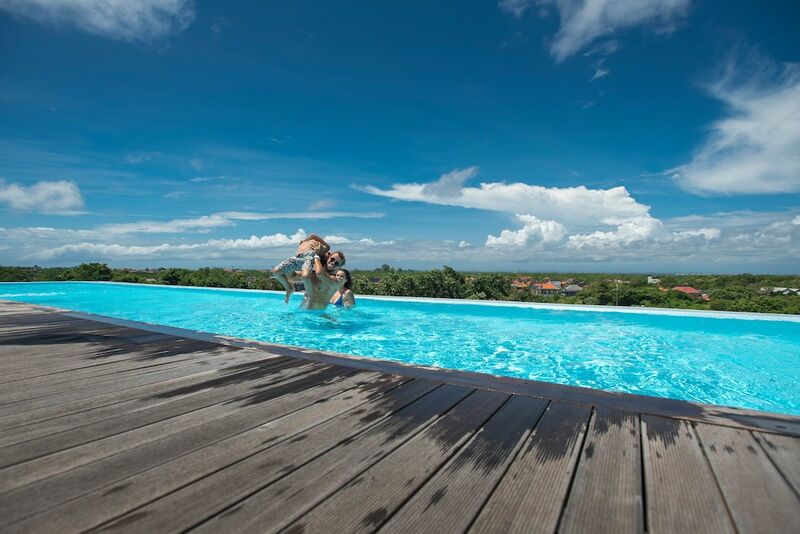 Therefore, it comes top when suggesting a place to stay with kids in Bali. Nusa Dua mostly comprises five-star luxury chain hotels, and each with direct beach access. Kids clubs, restaurants with kids' menus and fun activities in mind, as well as other supporting features for families naturally follow suit. Should I Stay in Jimbaran Beach with my Family? The iconic sunset bay of Jimbaran offers a relatively quieter, family-friendly stretch of sand when compared to the other highly popular beaches on Bali’s southwestern coastline. The area is also well known for its cluster of great seafood restaurants, one right on the bay, and another featuring a more refined atmosphere in the neighbouring fishing village of Kedonganan. It’s a great place to stay with family when you’re looking for a calmer seaside ambiance, but which is also close to the shopping and entertainment hub of Kuta. Ngurah Rai Airport is also just 10 minutes’ transfer next door. Should I Stay in Kuta Beach with my Family? Kuta is the place to be if you’re looking for where most of the action and excitement is. It is where most of the island’s modern malls can be found, including the Discovery Shopping Mall, and the larger Kuta Beachwalk complex that the kids will love for its multitude of entertainment and dining options – and with Kuta Beach only across the street. One of Asia’s premier water parks, Waterbom Bali, is here too, as well as most surf schools with lessons for your budding ‘groms’. Should I Stay in Legian Beach with my Family? Although slightly outshined in popularity by its immediate neighbour, Kuta, Legian offers families a calmer beach scene. A typical day out on Legian includes hitting a rented parasol-shaded daybed and sit back with a cold drink at hand while watching the kids playing around on the sand or in the waves. While the northern strip of Kuta Beach has hotels separated by the usually very busy beach road, Legian hotels are only separated by a narrower and quieter boardwalk meant for pedestrians. Family rooms, fun kids clubs, pools with kiddie sections and dining options offering kids menus are part of the options. Staying in Legian also means you get easy access to Kuta for the fun, and Seminyak to the north for chicer options. Should I Stay in Sanur Beach with my Family? Typically associated with Nusa Dua due to its quiet beaches and beautiful sunrises, Sanur offers a more affordable east coast experience for families. The beach resort area features quite a good mix of accommodation styles, from classic Balinese style villas to regular hotel rooms, and with family-friendly amenities, great dining choices, and an overall cultured and relaxed vibe. Sanur is a great location if you’re looking to explore Bali on family excursions to Bali’s eastern and central areas, due to the convenient access via the main highways. Most hotels you’ll find here are right on the beach, and although the beach itself is moderate, it’s great for kids for its mostly calm and shallow waters thanks to an outlying offshore reef. Should I Stay in Ubud with my Family? The small town of Ubud is the main destination in central Bali, where you’ll find a more artistic and cultured vibe against a backdrop of green valleys and rice terraces. Although Ubud fast evolved into a destination for yoga, spa and wellbeing, hotels and resorts in the area also cater well to families, with dedicated facilities and tailored activities for kids, and a range of adventure tours such as animal safaris and moderate white water rafting, which are great for families. Within town, great casual dining can be found alongside boutique shops and art galleries, heritage sites where traditional dances are shown nightly, and nature spots such as a nutmeg forest home to ancient temples and hordes of grey long-tailed macaques.